On Saturday, I had a second easy day at When Words Collide, so I picked a few sessions to attend: We’ve Been Edited, then World-Building: Your World is a Character, and Kaffeeklatsch with Dave Duncan before lunch, and You Oughta be in Audio in the afternoon. It’s possible to do back-to-back programming all day, but I don’t have that kind of stamina. I hadone time-slot where I had highlighted four different options on the schedule, because WWC puts together a lot of good stuff. For lunch, I stuck to the sandwich and snack concession in the dealer room, and I ended up sitting with an old friend. She has positive things happening with a second book, but it’s too early to talk about it now. Once again, it was the last event of my day that I enjoyed the most. Although Dawn Harvey and Nina Munteanu kept You Oughta be in Audio focused on the why and how of authors getting an audio-book version, and covered contract stuff like audio rights and payment options for engaging a professional reader, I learned that Dawn Harvey also offers courses for narrators that wish to turn pro. That would be me. I’ve been doing quite a few narrations for the AntiSF Radio Show, but I could use a little more info on the business and technical sides, so I might sign up if she puts a class on in Winnipeg. Dinner Debriefing: Caroline and I headed out for Italian food at Toscana Italian Grill. That was a walk of twenty minutes or more, but the weather had cooled, and damper conditions had cleared out most of the forest fire smoke from the air. We split a Caesar salad, then Caroline had the Parma e Funghi stone-oven pizza while I chose the Veal Scallopini. I couldn’t decide whether I felt more like the Piccata or Funghi di Bosco option, but went with the mushroom option on Pietro’s recommendation, and didn’t regret it. We ordered wine by the glass, so that we could have different reds, and there was a good selection. Service was swift and the food was tasty. We took half the pizza back to our hotel- by taxi, because there had been a rainshower, and it looked like more might be on the way. Would we go there again? Maybe, maybe not. It’s a longish walk. I liked the comprehensive Italian menu, but Caroline wasn’t wowed by the pizza. This is partly my fault; I make a wicked wild mushroom pizza. If you want the details on that, you’ll have to ask in the comments. Caroline had a conference in Thunder Bay last weekend, so we drove down. I was warned that the drive was a bit bleak, but it was beautiful sunny spring weather, and the scenery was of the rocks and trees persuasion, which works fine for me. Lakes were thawing, so we saw some that were open water, and others that were largely covered in candled ice. We stopped for lunch at the Riverside Lodge in Dryden. We were told it would be good, and it was. We pushed our dinner reservation at The Caribou back by half an hour to be on the safe side, and arrived in plenty of time. We had a nice dinner there, with exceptionally fine service. Example: Shauna always came by to check on us just a minute or so after our dishes arrived, so if there had been a problem, it would have been rectified right away. The meal got off to a strong start with an original bread-basket accompanied by hummus. I always feel that if a restaurant does well with basics such as bread and soup, the food will be good overall. See the dinner menu here. We shared an order of Calamari to start. The squid part was very agreeable- lots of tentacle bits, which we both like. We were less sure of the tamarind dip. Caroline took a dislike to it right away, and switched to the hummus that came with the bread, while I persevered for a while before deciding it really wasn’t for me. We shared a salad, the warm goat cheese one with Dijon vinaigrette. For our main courses, I chose a fish special—I forgot to take notes, but I think European Sea Bass, with barley done like a risotto—while Caroline ordered the Mafaldine Braised Rabbit with Pancetta, mushrooms, truffle butter, and Parmesan. Both were tasty and tender. There was a fair selection of wines by the glass, and many suited our personal tastes. We picked the Noble Vines Merlot, and liked it so much I went looking for it in an LCBO the next day, but they list it as discontinued. We finished with a chocolate torte thing that rounded out the meal nicely. We would go back on any future visit to Thunder Bay. We might try for a quieter night; Friday evening was busy and rather noisy. Saturday I had a day to myself while Caroline did conference things. A helpful front desk clerk printed me a map showing how to get to the scenic lookout on Mount McKay. I wanted to go there because every time I land on runway 30 in Thunder Bay, I get a good look at it from the pilot’s seat: Mount McKay is right beside an approaching aircraft. Map in hand, I programmed Dingbat, our long-time GPS, (notice I call him long-time, not trusty) and he knew a better way to get there. Which took me to a closed bridge. I told him to detour, and he diverted me to Boundary Road, which is blocked by gates to the mill property. When I attempted a second detour, Dingbat tried to guide me back to the closed bridge. Apparently, the Garmin algorithms do not deal well with double detours. I got the map out and did it the old-fashioned way. 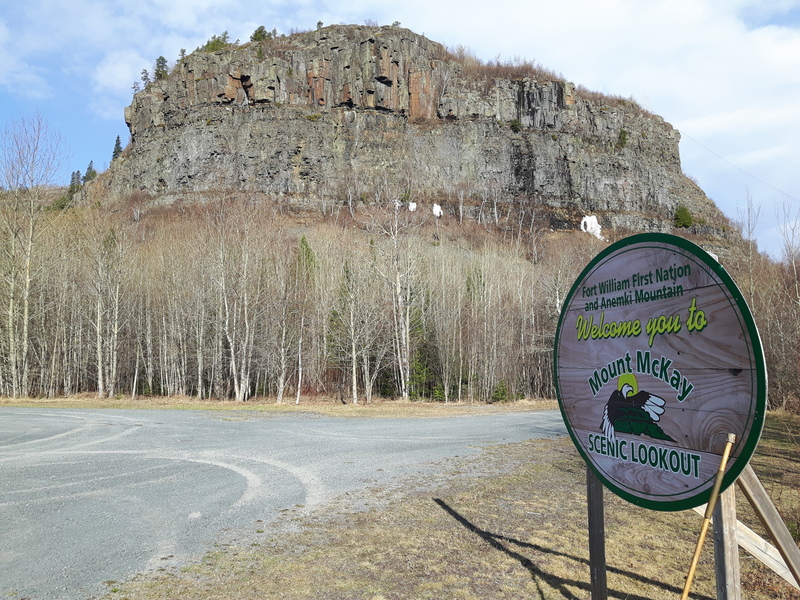 The trip up the base of Mount McKay was serene, and a sign at the base said the scenic lookout was open from May to October, between the hours of 9:00 am and 11:00 pm. They didn’t mean all of May, apparently, because there was no one at the toll gate when I arrived at 9:15. Still, I had been told it would be okay to park my car outside the gate and walk in, so I did. It was about a twenty minute walk up the winding blacktop lane to the lookout. Because we went by road, I had my titanium hiking staff with me! I can’t take it when I travel by air, because: one, it’s oversize and the cost is prohibitive, and two, it’s packed with survival supplies including some fire starting thingies that are prohibited on aircraft. Click to zoom in on this picture, and you can see that my staff is on its third wood grain paint scheme. This is as close to the edge of the drop as I cared to get; there’s a vertical drop of a hundred feet or more. You can see Thunder Bay’s runway 30 in the distance. 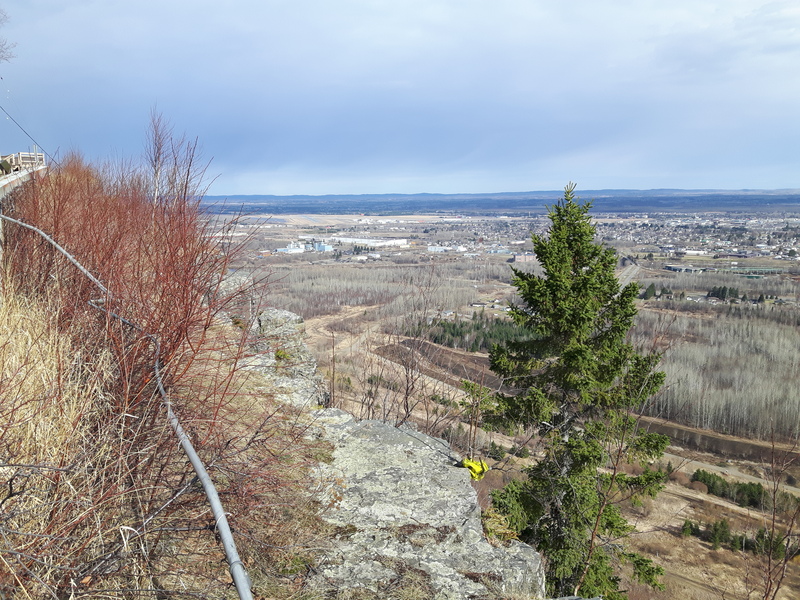 There was a hiking trail that started at the scenic lookout, but it quickly became steep, and crossed scree slopes that I didn’t care to try alone with the ice still coming out of the rocks. Saturday we went for dinner at Bistro One. We’d heard good things about the food, and we weren’t disappointed. On the other hand, the meal was slow getting started. We began with some classic French bread with roasted garlic and butter, but then there was a long pause before we saw anything else, and our server seemed to be avoiding us. I started with the Sesame Crusted Ahi Tuna, while Caroline chose the 5 Hour Roasted Confit of Ontario Duck Leg. We were both happy with them, although the duck leg was salty, as it often is; some chefs believe this dish should be rinsed, some do not. The wine list here wasn’t quite as tailored to our tastes, but there was a good choice of wines by the glass. For entrees, Caroline had the Roasted Fillet of Atlantic Salmon while I decided on the Cognac Flamed Breast of Duck. Both dishes were superb. By the time we were done, it was getting late, the staff were clearing things up, and there was a hockey game on, so we didn’t linger for dessert. We wouldn’t be likely to go back, but this restaurant was tranquil, and might suit people who wanted to take their time and talk. Caroline’s conference finished before noon on Sunday, so we hit the road, pausing for lunch in Upsala. We were told it would be okay, and it was. There were two incidents of note on the way home. First, I saw moose. Not one, but a group of four. They were down by the ditch, so it was more interesting than startling. I flashed my hazards at the next truck, in case they moved onto the road. Second, we got flagged down by motorists with two cars stopped at the side of the road. I pulled over immediately, in case someone had been hurt in an accident, but they just needed a screwdriver to remove a wheel-well liner that was rubbing on a tire. Boy Scout that I am, (well, was once) I had tools including a Leatherman and a multi-tip stubby that was just the thing. We had them fixed up in minutes and were back on our way. All in all, a nice little trip. I’m cheating a little in calling this a dinner debriefing, because we actually went for lunch at Café Dario in Winnipeg. But I’m not cheating very much, because the lunch menu is built on the entrees from the dinner menu anyway. The main difference is that while dinner is a five-course meal, the lunch menu features an entrée plate accompanied by bread and soup. The menu changes fairly often, and reservations are required for dinner. We heard about this restaurant from a friend of a friend, but it has received lots of good reviews, and has exceptionally good write-ups at Trip Advisor. The chef is from Colombia, so there are lots of interesting South American influences on the cuisine. The day we were there, the soup was a butternut squash. It was very tasty, with a little spice, but I’m not sure quite what it was. Ancho chile? We saw lots of things we liked on the menu. 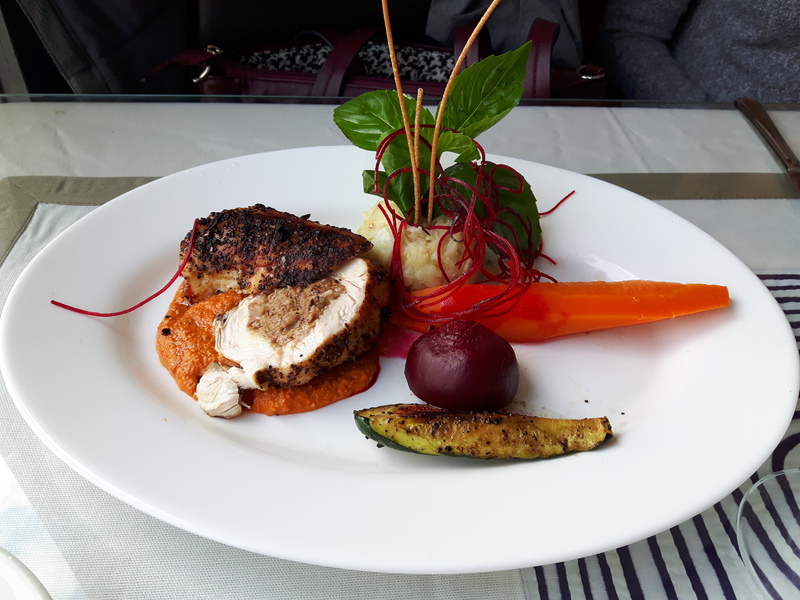 Caroline chose the Chicken Breast stuffed with guava pulled pork, which came with a Romesco sauce. She had a glass of wine with it, but I cannot remember which one, and I don’t see the wine list on the website. I think it was a Malbec, because South America. 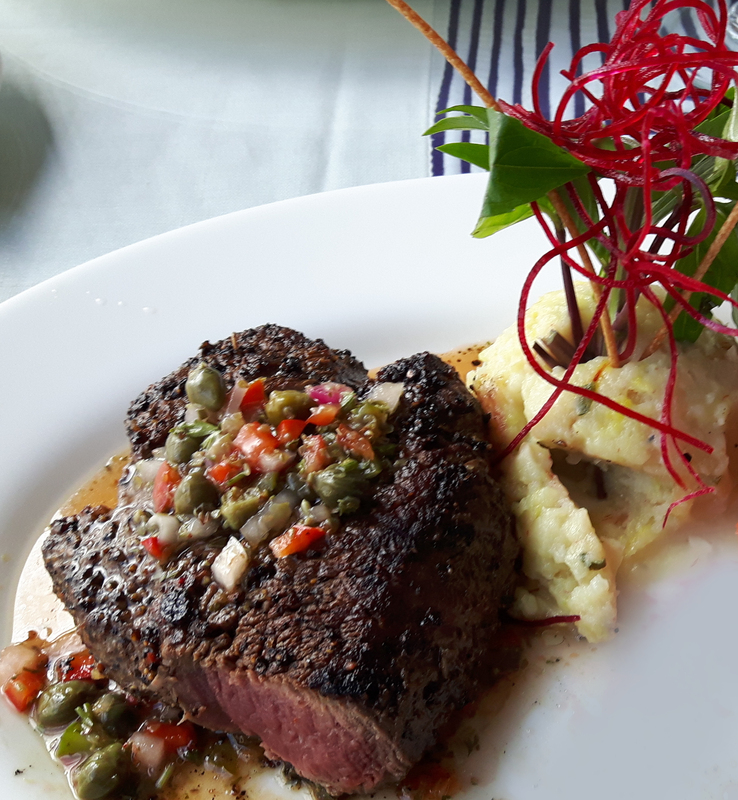 I was torn between the Beef tenderloin grilled and topped with Argentinean chimichurri sauce or the Pepper crusted rack of lamb with a red pepper mango puree. The server mentioned that the beef is one of their top sellers, so I ordered that, and a glass of Dos Equis Amber. I’m all about amber ales lately, especially now that the weather is turning cool. I love the toffee notes and the lack of hops. I cut into my steak before taking this picture, and also moved a beet, which left a pink smear on the plate. In fairness to the kitchen’s beautiful presentation, I airbrushed the lower right corner of this photo to remove the stain. The steak was wonderfully tender, and both of our dishes were delicious: zesty without being overtly spicy. As you might expect from a restaurant with Colombian roots, the coffee was exceptional. The service was good, and the bill was remarkably modest. Café Dario is located at the corner of Erin and Wellington, which is not too far from many of the airport hotels. We’ll be back. Dinner Debriefing: Three dinners and a breakfast in Ottawa. We flew to Ottawa for Can-Con, a convention about speculative fiction in Canada. That means we spent some time apart. Meals were the centerpiece of our time together. Friday we returned to a place we knew we liked: Play Food and Wine. We made a reservation this time. This is a small plate restaurant, much like a tapas bar. The food is superb, starting with the sourdough bread and butter. Although we ordered a variety of dishes, we chose a bottle of Pinot Noir because this wine can be very versatile. There was a fine selection of wines by the glass, if you prefer to match more thoughtfully. Here’s the menu we ordered from. We chose the salmon tartare, the gnocchi, the trout and the hangar steak. If we were disappointed by the gnocchi, it was only because there were so few compared to the accompanying vegetables. The other dishes, we would order again in a heartbeat. The tasty hangar steak is one of their top sellers, by the way. We finished with a selection of cheeses, choosing three of the harder ones. Service was excellent. Saturday we started with breakfast at Wilf & Ada’s, another repeat visit from last year. We knew to arrive three minutes before they unlocked the door, as this small restaurant fills up minutes after they open. Caroline had the eggs in purgatory, a skillet of eggs poached in a hot sauce. I had the blackstone, a variation on eggs benny with locally sourced bacon and the addition of fresh ripe tomato slices. Food here is locally sourced and they cook nearly everything from scratch. You can tell. Saturday evening we wanted to see how the renovations in the Novotel’s Albion Rooms turned out. Last year, this was a small alcove of butcher-block tables tucked away behind the lobby bar. The food was good, and they’ve expanded beautifully. As I write this, the website doesn’t yet show the larger, more gracious room. You’ll have to take my word for it that there are paneled walls, sconce lighted art and graceful clusters of curved banquettes as well as tables with chairs. This sample menu is close to the one we ordered from, but not identical. For instance, Caroline’s Mariposa Duck included both breast and confit. My main course was a Lamb Curry that came in a deep dish with sauce and lentils. Caroline’s starter was the Blueberry Lavender Gravlax from the Charcuterie section of the menu, while mine was a Trout Crudo that does not appear on the sample menu at all. It was crispy on the outside, delicate in the middle. Caroline rated her duck dish among the best she’s had. I liked my lamb curry well enough, but wouldn’t choose it again. We had the James Mitchell Cabernet from Lodi, California. No dessert as I wanted to get back to the conference. I tried it, and it tasted every bit as good as it looks. I thought about having the scallops, but I wanted to do a wine flight that ended with a red, so I chose the beef tenderloin instead. I wasn’t disappointed. The duck fat fingerling potatoes were lovely. As to the wine, Caroline paired the Casa Dea wines from nearby Prince Edward County: Pinot Noir with the rabbit and Chardonnay with the halibut. She much preferred the red, which recently won an award. The Chardonnay was flinty, which I like, but she doesn’t. She was hoping for a bigger, leggier wine. I chose a flight of four 2oz. glasses. Sur Lie offers several different flights, and I went with the Big & Bold one because I liked the idea of starting with Gewurztraminer and finishing with Cabernet Sauvignon. Also, I got to try wines I would hesitate to buy a whole bottle of: a French Cabernet Franc, a Portuguese red blend, and a South African Cabernet Sauvignon. I enjoyed each of them, but I think the variety added to the fun. Our server was very knowledgeable. We splurged on dessert, both ordering carrot cake even though there were some other tempting options. It’s a good thing we ordered two, there would have been a vicious fork-fight over one, because it was delightful. Sous Sol is tucked away in a basement in Winnipeg’s Osborne Village. There’s barely a sign. I’d say you have to be hip to eat there, but then I’d have to explain how I snuck in. The menu is small, and changes often, so I don’t know how long that link will work. The ambiance is candlelit. The art is consciously trashy, which pairs well with the dim light. The chinaware is ornate, but mismatched, as if it were bought at yard sales. The food is divine. Caroline and I joined our friend Donna, our Winnipeg guide to out-of-the-way bistros. I started with the French cheese selection: a sharp goat cheese, an unpasteurized Trappist and a bleu, with an apricot compote, a tomato coulis and crostini. I let the ladies eat the bleu in exchange for a sample of the Fennel Salad they shared. Caroline had the pork tenderloin, paired with the mushroom ragout. The pork was perfect. I chose the beef noisette with king oyster mushrooms and Calvados barbecue sauce. I also teamed it with the mushroom ragout. Donna had the crab croquettes with remoulade, poached egg and caviar. Technically, that’s a side dish, but it was as generous as the entrees. She got an order of sweet potato gnocchi for sharing. Everything was excellent. Donna ordered the wine, the Chateau de Gaudou Malbec Merlot. It was too dark to see the colour, and I draw the line at turning on my smartphone’s flashlight to check it out when other people are trying to enjoy a meal. It tasted rich and dark, and we enjoyed it. Caroline and Donna shared the last slice of a chocolate cheesecake, but I don’t remember the details. Would I go back? Yes, definitely. In fact, this was our second visit.